Ever since their first commercials propelling them onto the national stage more than a decade ago, the Blue Man Group has become one of the hottest sensations of the western world. They give regular performances in cities around the continent and they are even well-regarded in Europe , something that is rare for a group that is primarily in the area of production shows. With all of this in mind it is perhaps no surprise that the Blue Man Group has become so popular in Las Vegas . The Blue Man Group performs in a theatre located in The Venetian. The Venetian is one of the major resort destinations in Las Vegas and is located on the Las Vegas Strip. This is the most important strip of land in the entire city and for that reason seeing a performance of the group will also put you within walking distance of just about everything else worth doing in the city of Las Vegas. In other words, the location is absolutely fantastic. 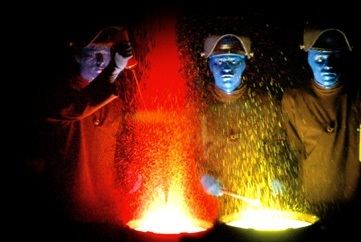 The Blue Man Group does perform on a regular schedule that for the most part is also fixed. They have at least one performance everyday on this regular schedule, although there are days that are dark for tours or special occasions. Barring those types of circumstances however, a typical week will see the Blue Man Group perform at 7:00 in the evening on Sundays, Tuesdays and Thursdays and at 7:00 and 10:00 in the evening on the other four days of the week. There are three different major zones of seating in the theatre. The green zone is the cheapest at $71.50 per ticket, although the seats are the worst in the theatre. The red zone is slightly better with tickets valued at $91.85 and the blue zone is the best regular seating in the theatre with ticket values of $132.00. The Blue Man Group is of course very well known, but just in case you're not sure who or what they are, consider yourself in for a real treat if you buy tickets to one of their shows. They are a musical group that delights in creating music out of percussion instruments that you wouldn't normally consider musical. Things like pipes and telescoping cylinders become the highlight instruments of the performance as the Blue Man Group creates startling melody after startling melody in their quest to come up with the perfect percussive song. Every performance is just a little bit different because of that, but they are all worth seeing. The main criticism that can be levied at this particular Las Vegas show is that it lacks an ultra-cheap ticket option. This is partially because even the worst seats in the theatre are not really that bad, but it is something that hurts it with economical tourists that want to visit Las Vegas as cheaply as possible. If you have the money to afford the tickets however, the show is most definitely worth the price of admission.